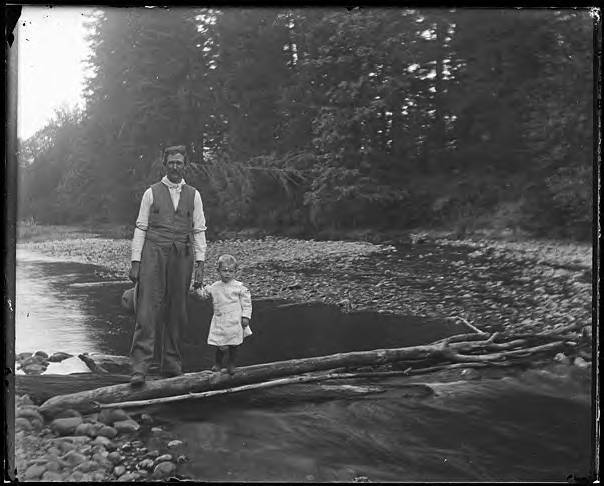 Black and white image of a man standing on a log over a creek, holding the hand of a small boy wearing a light-colored, striped dress. The creek water is low, and a gravel bar fills most of the creek bed behind the pair. The man wears a white shirt with sleeve garters, a kerchief tied around his neck, and loose baggy pants beneath a vest. Loyal Graham was a lawyer from Nebraska who moved to Oregon after 1910 and began practicing law in the Forest Grove area. He was later elected to the state legislature, where in 1919 he authored the nation's first gasoline tax law, making Oregon the first state in the nation to charge drivers for road maintenance and construction. Drivers paid 1 a gallon at the pump. Two of the first projects funded were the Oregon portion of the Pacific Coast Highway (now U.S. 101) and the Columbia River Highway (now Interstate 84).